It was a rainy day in November but the cloudy and gray sky, combined with half-destroyed buildings and ghostly railway tracks, seemed like the ideal scenario for photography. I was wandering around industrial warehouses with broken windows and rusted Soviet machinery. 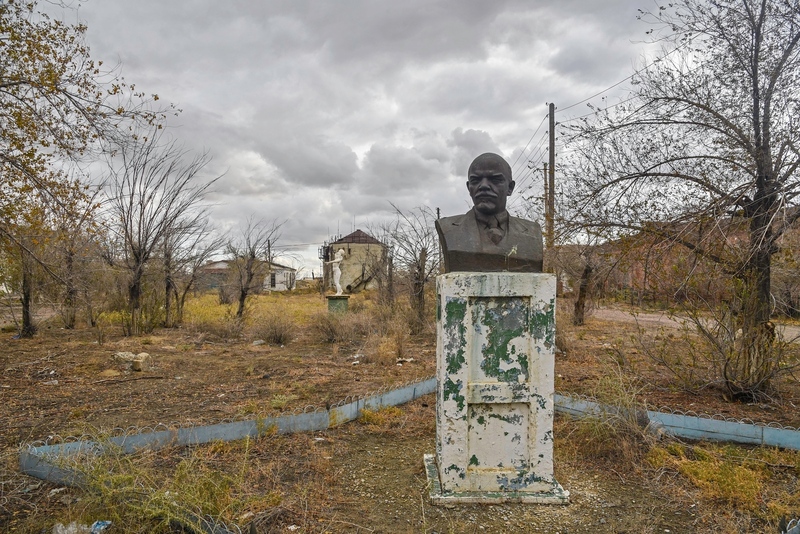 I bumped into a Lenin bust which was surrounded by weeds and located in what seemed to be the main area of hanging out in the industrial park. 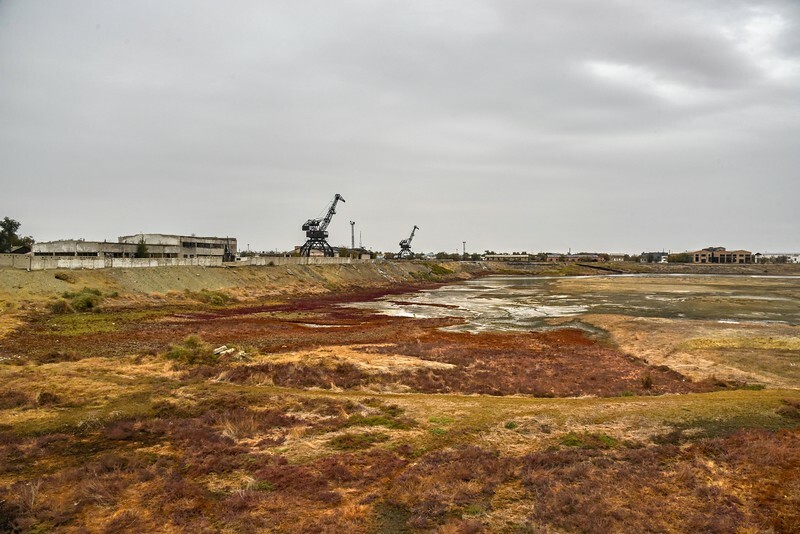 From there, I could also see the great Aralsk harbor, composed of massive cranes, also rusty, and built on the shore of a gigantic, deserted and horrifying plain. There was absolutely no one around but that enormous complex was the real proof that, back in its day, Aralsk had been a prosper and vivid city. However, today, all I could see was a semi-abandoned and hostile town caused by the worst man-made natural disaster. During the 60s the Soviets decided that they wanted to become one of the world’s top exporters of cotton, which at that time, was called white gold. However, cotton is a product which requires huge amounts of water to grow and, since the steppe of both Kazakhstan and Uzbekistan was practically a desert, they had no other choice but to divert the Amu Darya and the Syr Darya, the two major rivers that fed the Aral Sea, the second largest body of inland water in the world. Cotton irrigation, plus the poor quality of the water pipelines, resulted in 75% of the water either evaporating or being lost en route. It triggered a process that ended up with the almost total disappearance of the Aral Sea, which had terrible consequences for the economy, the environment, and also to people’s health. Many people have been diagnosed with pulmonary-related diseases as the air carries toxic particles, especially evaporated salt. The sea was located between Uzbekistan and Kazakhstan. On the Uzbek side, the largest town I visited was Moynaq. In Kazakhstan, it was Aralsk, a city that used to be the most important industrial fishing center in the entire Soviet Union but today is just a city with a harbor, but no sea. It is located in the middle of the Kazakh steppe, surrounded by nothing but abandoned factories and desert. The Aral Sea dried out almost completely, becoming an ugly desert and what little water remains has such a high concentration of salt that only halophilic microorganisms can survive. Aralsk was a very important fishing center. Evidence of this can be seen in the harbor, as well as in the center of the industrial park. You can still see the end of a railway track, which was built to transport fish every day from boats to warehouses. Today, Aralsk is situated in rural Kazakhstan, a hopeless city with an extremely high unemployment rate. The city is very sad and the only similar thing I had ever seen before was when I visited the Urmia lake while I was traveling in Iran, They aren’t really comparable, however, because the Aral Sea is much larger. It is said that many inhabitants from Aralsk are kind of hostile towards foreigners, as the disappearance of the Aral Sea made their lives very miserable, so the fact that their misery has become a tourist attraction is considered very disrespectful. Honestly, I didn’t feel any sort of hostility but the locals mostly ignored me or showed a very neutral attitude. However, young people were very kind and, in fact, I met a few very nice guys who stopped me to practice their English. I guess that they were too young to remember those good, old times, so it wouldn’t make a lot of sense for them to hold a grudge against me. I think that travelers who have reported some hostility were referring to the elderly people who lived in the Golden Era of Aralsk. In 2005, with the help of the World Bank and other international organizations, Kazakhstan finished building a dam which will begin the recovery process of the Aral Sea. Today, the recovery is already visible and, very close to a village called Tastubek, 90km north of Aralsk, you can already see a small lake which has been baptized as Small Aral. To be honest, the sea is still decades away from the capacity it had in the 60s but, in the Small Aral, fishing is back and, apparently, they have already developed a small fishing industry, which is a clear sign of recovery and, of course, provides hope to the inhabitants of the region. Visiting Aralsk is what I consider as dark tourism, as all its tourist attractions are directly related to the disaster. Next to the museum, there is an old boat which has been restored and that you can climb to get some views of the harbor and a flat desert which used to be the depths of the second largest lake in the world. I strongly recommend getting down to this desert and walking around a bit. 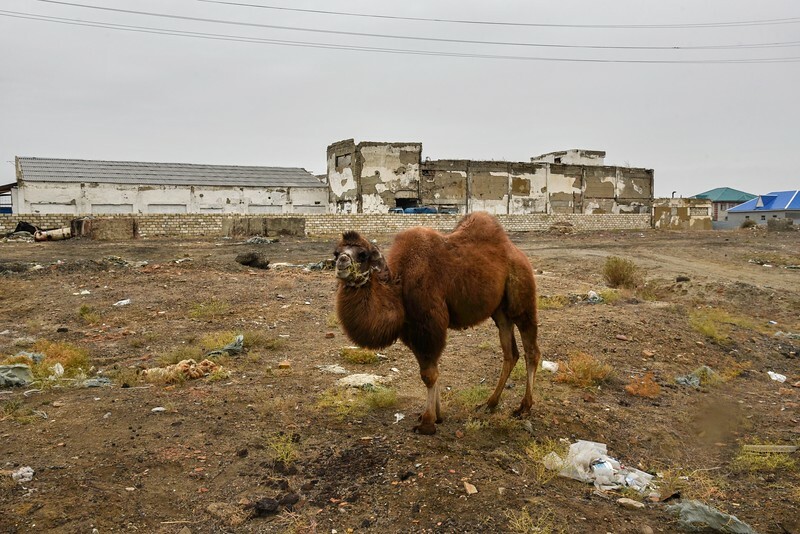 You can see camels, a tiny rusty ship and the big concentrations of salt that still remain. 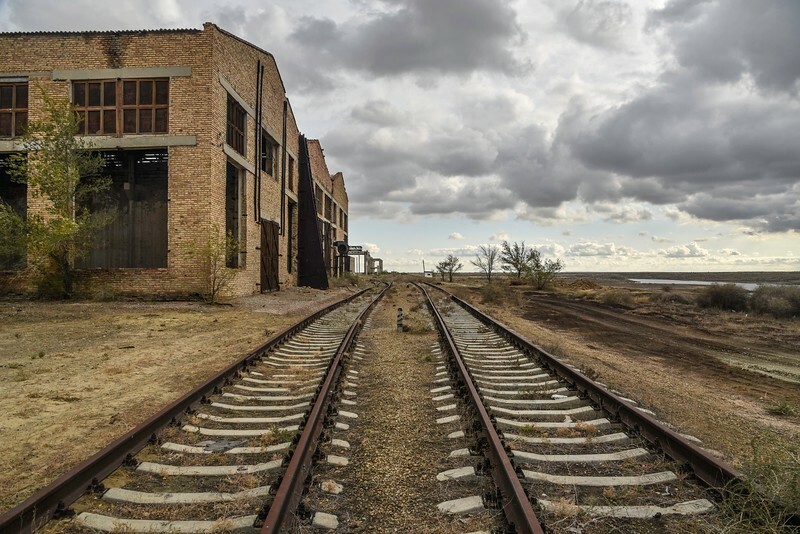 Of course, you can also visit the harbor, where you can see the ghostly railway track, and some rusty Soviet machinery. On the west side of the harbor, you can find the huge abandoned industrial park. For me, this was the most interesting part, especially because you can still see some Lenin statues and other Soviet symbols. Nevertheless, entrance is not allowed. I managed to sneak in by jumping over a fence and spent nearly an hour taking photos but I was eventually caught by a security guy who, very kindly, without giving me any problems, took me to the exit. 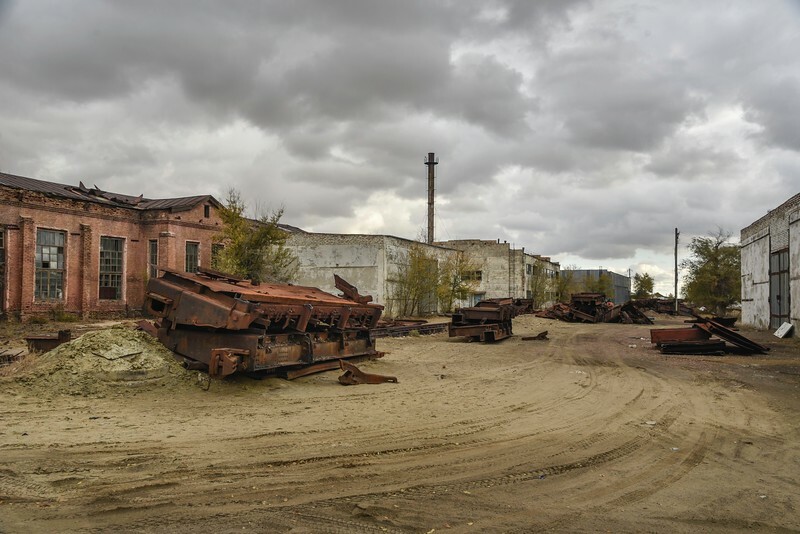 The most famous tourist attraction in Aralsk and, probably, one of the most wanted things to visit for people traveling to Kazakhstan is the ship graveyard. Just bear in mind that the graveyard is not in Aralsk but in Zhalanash, a tiny village 70km from Aralsk. The first and easiest would be going by taxi. A round trip ride costs around 100USD. The second option would be going by public transportation, but you will have to spend the night over there because the bus from Aralsk to Zhalanash leaves around 3 pm, but doesn’t come back until the morning of the next day. The last option would be hitchhiking. I don’t know how easy it is but it should be feasible. Personally, I didn’t go because I had just came from Uzbekistan and had already seen the ship graveyard in Moynaq, the southern part of the Aral Sea. In Moynaq, there are more than ten boats exposed, whereas in Kazakhstan there are just 2 or 3 and, as far as I understand, the Government is slowly removing them. For years, Hotel Aralsk, located just next to the museum, used to be the only available option. However, when I went there, the hotel had closed permanently. The new alternative is a hotel named Altair, located just next to the train station. It is actually a very weird hotel, one of those where you can meet all sorts of people. When I was staying, there was one backpacker couple and a businessman who brought a prostitute to his room and spent the whole night with her being very loud. However, the hotel was rather clean and it had budget dorms. Aralsk has a train station that belongs to the main railway line of Kazakhstan, so one can get there from pretty much anywhere in the country. It is 1,700 km from Almaty and the train journey takes 24 hours. Personally, I came from Atyrau, located in the west of the country. A ticket cost me 4,000TEN (US$11.80) and the trip took 20 hours. From Sudan to Pakistan and Central Asia, for the last few years, Joan Torres has been traveling non-stop to real off the beaten track destinations which don’t tend to be on most traveler’s bucket list. He tells about it on his blog Against the Compass, where he writes extremely comprehensive and useful travel guides, as well as inspiring travel stories.